From the moment your lungs take in that first breath of warm, comforting and humid air you know you have entered the Boettcher Memorial Tropical Conservatory. The Tropical Conservatory is home to over 550 species of plants spanning 306 genera from 87 plant families from all over the world. You have probably seen many epiphytes on previous visits but maybe didn’t know what they were. Read on and I shall cast some light on these wonderful oddities! Epiphytes are organisms that grow on the surface of host plants, often attaching themselves with strong roots. They obtain moisture from the air and nutrients from debris around them. A common example of this would be Spanish moss (Tillandsia usneoides) growing off of a tree branch. Epiphytes differ from parasites in that they attach only for physical support, not for food or water. They are found in every major group of the plant kingdom, including some species of algae growing under water. 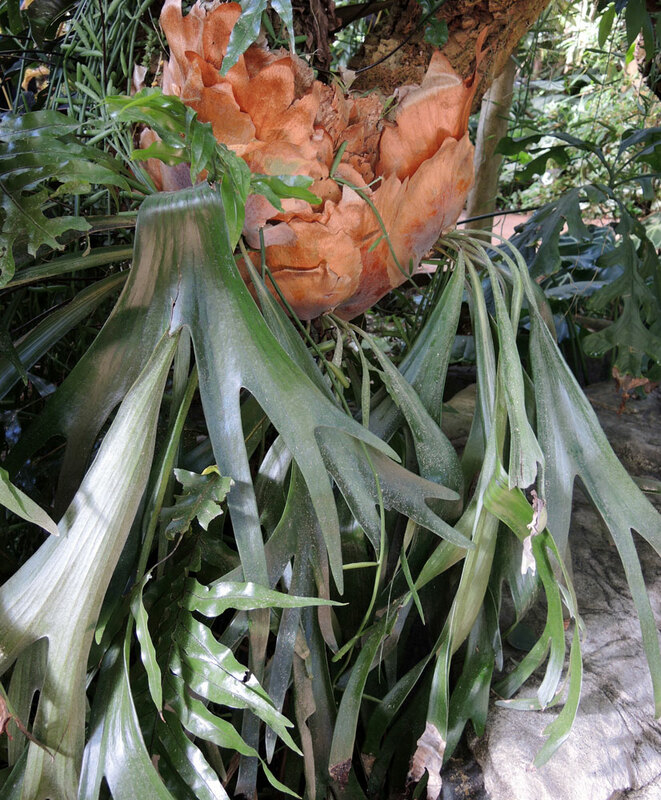 The Tropical Conservatory is host to many epiphytes, and they come in many different forms. As you enter the Tropical Conservatory from the east end, take a few steps in and look up to the right. In a planter pocket of the rock ledge grows an exciting epiphytic orchid, Grammatophyllum speciosum. 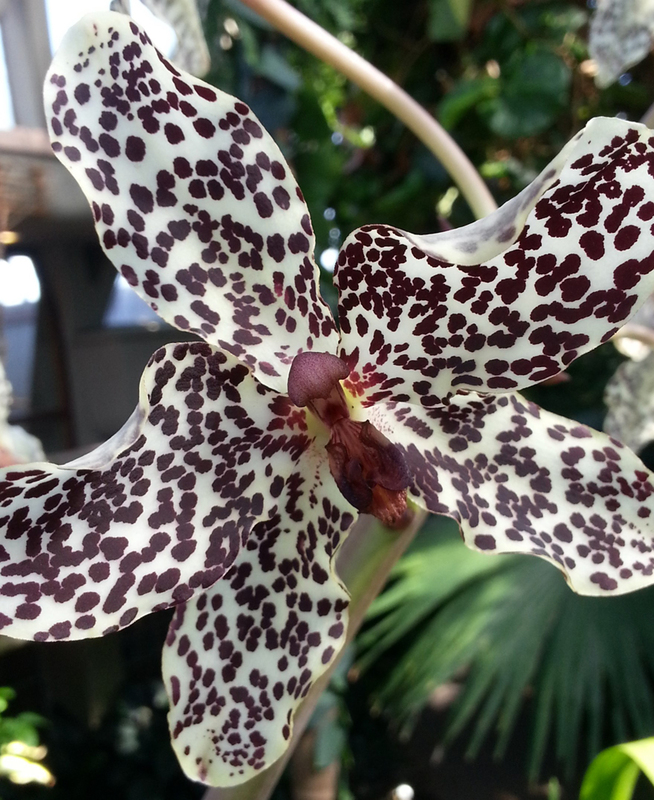 Native to Indonesia, it is also known as the sugar cane orchid, because of the appearance of the pseudobulbs. The largest plant was recorded as weighing more than a ton and each raceme can bear up to 80 scented flowers. It can remain in bloom for up to 2 months. Continue down the path, past the duck pond and up the stairs to the main level. From the top of the stairs turn right and look at the wall. 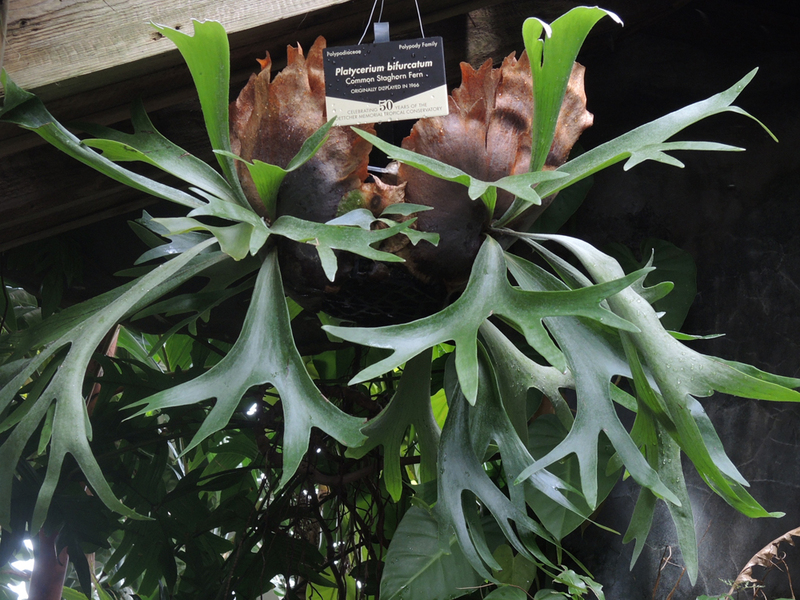 Here you will see Platycerium bifurcatum, or staghorn fern, mounted here. It is native to Java, New Guinea and southeastern Australia. They require consistent moisture and shady locations. It is widely cultivated as an ornamental plant. Its common name comes from the appearance of the dissected fronds. 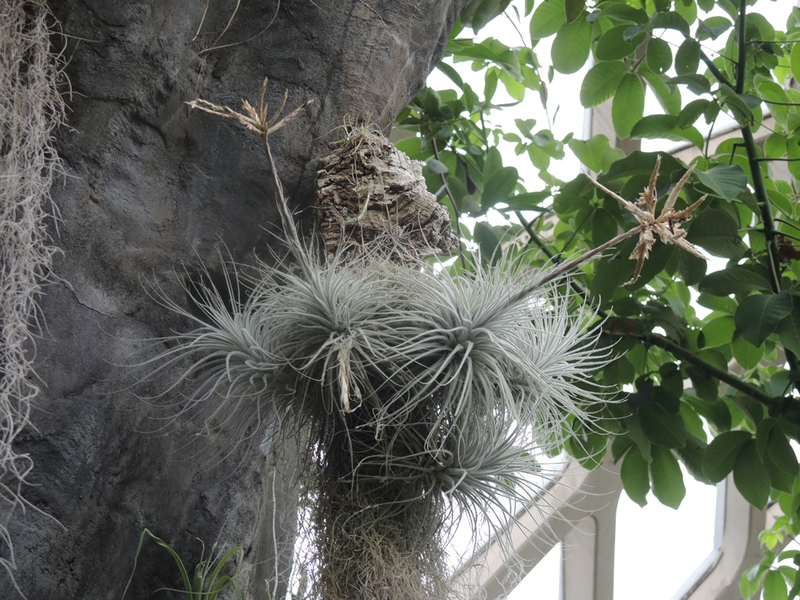 The final plant on our epiphytic journey is an amazing silvery plant called Tillandsia tectorum. It is found at the top of the treehouse, the highest point you can get to in the Tropical Conservatory. 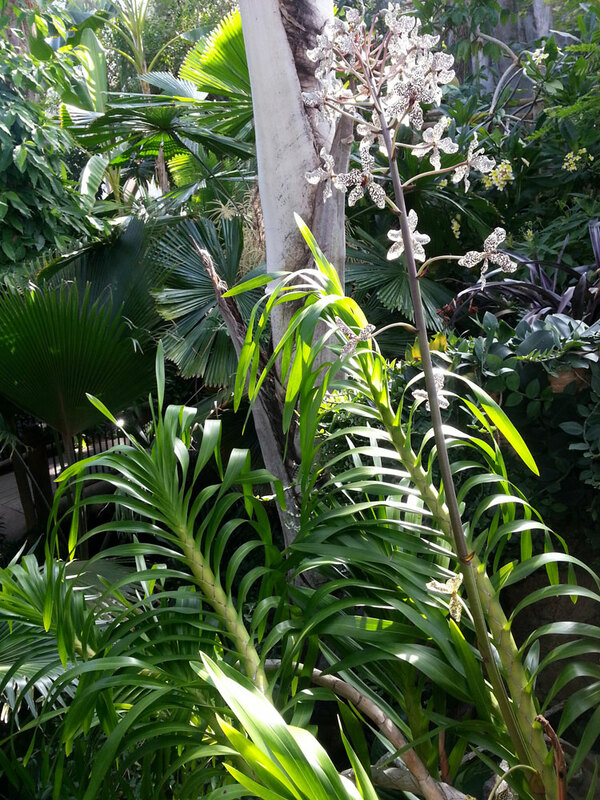 It has many thin, very silvery leaves and loves high light and heat. This plant is native to Peru and Ecuador. In late summer it gets a lovely light purple/pink bloom that can last for several months. This species is well suited to Colorado because of its love of low humidity and intense sunlight and makes a great plant for you to try at home.